Welcome back to my look at Star Wars: Tales of the Jedi. Last week we talked about Golden Age of the Sith and how the advent of the Daragons into Sith space brought about Naga Sadow’s Great Hyperspace War. Today, the Daragons return to their home in the Empress Teta system…but all is not well in their arrival. Naga Sadow, ever the schemer, releases Jori in her own ship – the better to track her and follow her home, after all. Ah, what would Science Fiction do without the good old tracer in the ship? Barring that, they might have to come up with unique methods of following somebody. Anyway, while Jori is busy leaving, Naga Sadow frames her for the death of Simus*, his own mentor. It’s pretty clear her what Sadow will do to meet his ends, and while most regular Star Wars readers need little in the way of reminders about a Sith Lord’s lack of compunctions, for the new reader this is a clear wake up call that, no matter their intentions, there are no clearly defined “good guys” among the Sith. Jori, not so weak-willed as to believe that the Sith Lord’s intentions are anything but trouble for the Republic. Unfortunately, she finds herself in a world of hurt as she is not only quickly arrested for stealing the Starbreaker, it is impounded and given to the foolhardy merchant who lost his ship ignoring a warning Gav and Jori had placed on a route. Gav, meanwhile, has been kept on to become Naga Sadow’s apprentice. While Gav has his own doubts, he is placated enough by this position not to defy his Master too aggressively – until it is too late. Over time, he pieces what’s going on together and works to help defeat Naga Sadow, after Jori finally gets in touch with him. The Fall of the Sith Empire, ultimately, is Naga Sadow’s great tragedy. As he enters into combat, his forces are successful, until Jedi Battle Meditation causes them to be completely routed. As he staggers home to regroup, the great invading fleet faces the remainder of the Sith forces turned upon them, as Ludo Kressh – who survived Sadow’s attempt to kill him before leaving for the Republic – leads the home defense fleet against Naga Sadow’s offensive fleet. The two factions destroy one another, leaving the entire Empire – that which both Sith Lords fought to save – ripe pickings for a Republic fleet looking for revenge for the damage done to their worlds. I don’t believe the comic ever follows through on the genocidal implications of this, but it is true that in the Star Wars mythos, this marks the end not only of the Sith not only as an empire, but as a species altogether. This story , despite its melodramatic title, does not carry some sweeping grand statement about selfishness being causes of the downfall of the Sith Empire, or ultimately whether the writer felt Naga Sadow or Ludo Kressh to be the wiser leader. No, it many ways when it comes to the war, Fall of the Sith Empire treats itself very much like a historical text (plus dialogue). This is what happened, and such themes as causes and morals are paid scant attention save for when the characters interpret them. No, the strength of this story in writing of Jedi and Sith is the miraculous things it demonstrates – species, technologies and powers that help to expand the Star Wars universe into a galaxy with not only a fascinating present, but a storied and unimaginable history. More attention than the inner workings of the Sith Leaders is paid to Jori and Gav Daragon, two scouts who have no grasp on the potential they carry within the Force, and just like the audience are thrust into things much larger than themselves that they have no hope of influencing consciously. Perhaps this story would feel stronger, and more dramatic, if the Daragons were either focused on much more strongly (ignoring, perhaps, the pleating Odan-Urr, who gives the Skywalkers a run for their money) or ignored them entirely after they had served their purpose, focusing more on the struggle between the Sith and the Jedi. Ultimately, in treating both of these conflicts as equal, the script loses some of its punch, reduced to a play by play of what happened in the war, and what happened with the twins. The events that happen are dramatic enough, but the story is simply not focused sharply enough to drive either of them home with any emotional depth. 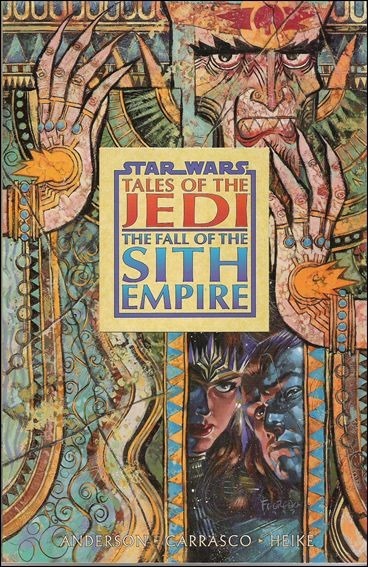 Tales of the Jedi: The Fall of the Sith Empire does what it set out to do in telling you what happened to the once-great Sith Empire, but ultimately it falls short of deliverying quite the emotionally effective story that novel readers and film watchers would have by this time become accustomed to. This isn’t a unique issue to this volume, in this era, which leads me to wonder whether it would take some time before Dark Horse quite got the hang of creating Star Wars. It’s not a terrible comic, it’s just not as good as a lot of media in Star Wars, which makes it most readable if you’re a fan of the series who is interested in learning about its history more than a great story as it stands alone.